$500 off May Rent! .on apartment homes listed or pictured directly below. Waiving deposit, Free Parking, No pet rent! Six weeks Free Rent! .on apartment home listed or pictured directly below. 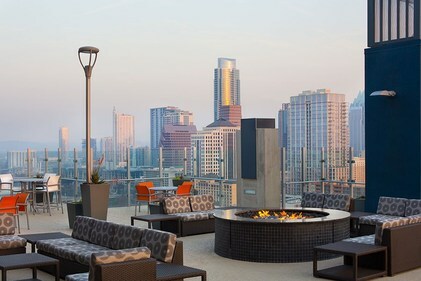 Elevate to highrise living in Austin where exceptional downtown views and luxurious amenities await you. You'll delight in the opportunity to lounge at the resort style pool and entertain on the roof top deck or get fit in the state of the art fitness center. Embrace your new luxury apartment home by taking advantage of the open kitchen with island counter tops finished with dark marble, surrounded by stained wood flooring and relax in your bedroom as you revel in the spectacular view from you 10 ft floor to Ceilings windows. Please call to view. 1/2 off App, Admin and Deposit! .on apartment home listed or pictured directly below. Live in Luxury in one of Austin's finest mid-rise communities. Lavish in the superior lifestyle setting located in the heart of Austin's primer epicenter just foot steps from the hike and bike trails along Barton Creek and Lady Bird Lake in the Barton Springs neighborhood. Enjoy multiple dining options, and recreate at Austin's crown jewel, Zilker park. While residing in your new apartment home you will also enjoy countless designer upgrades and amenities that can be found at the link below. Cheers and please call me for specific leasing information. First Month Free Rent! .on apartment home listed or pictured directly below. 2 Bedroom 2 bath 1,138 SqFt. Mid-rise living at its finest. This extraordinary apartment home has postcard views of the city, a pristine and spacious floor plan, combined with a highly functional flow. You'll enjoy the modern architecture of your apartment home as well as your community. Set in the strategic corridor of downtown, this beautiful luxury apartment home offers waterfront living and easy access to the new boardwalk, restaurants, stores and bars with out leaving the parking lot. Six Weeks Free Rent .on apartment home listed or pictured directly below. One of the crown jewels of Austin's Luxury Apartment home communities. This brand new Highrise offers the finest of amenities in a state of the art LEED certified green living building. You will know you found a place to call home when you first walk into the boutique style lobby. You'll enjoy the short walk to Downtown, Lady Bird Lake and the plethora of shops, bars and restaurants Austin has to offer. This is Austin Luxury living at it's peak. Please call to schedule a viewing. Please call for move in special! 1 Bedroom 1 Bath, 1,082 SqFt. I have an amazing dual level luxury apartment home for rent is South Austin where you will enjoy a tranquil and relaxed environment in an unsurpassed location! Luxuriate in an ultra modern dual floor-plan, while you revel in the stunning Austin skyline. The best entertainment that Austin has to offer is mere minutes away as you will be centrally located in the very heart of the city! Don't delay, secure your luxury apartment today! One month free at $1745 per month for 12 months = effective rent of $1599 Please call to schedule a viewing. First Month Free Rent! .on apartment home listed or pictured directly below. Must move in by May 30th. 2 Bedroom 2 Bath, 1930 SqFt. This is a unique opportunity to live in one of Austin's premiere locations! Views of the iconic downtown skyline and Lady Bird Lake can be enjoyed daily from your brand new apartment home. The community itself, plus the luxurious amenities, combined with an absolutely unbeatable location comprises the ultimate living experience. Come and live in Austin's newest and finest of apartment home communities offering a rooftop resort style pool and all the luxurious amenities one could wish for. Please call to schedule a viewing. Half off first months rent! .on apartment home listed or pictured directly below. 1 Bedroom 1 Bath 626 SqFt. This newly available luxury apartment home offers contemporary lifestyle living in one of the most vibrant and sophisticated cities in the country. Your new apartment is located in the thick of it all with shopping, dining, entertainment and schools all within walking distance. All the amenities you desire are available in your new home. From the pool and outdoor grills to your private balcony, you will be delighted to come home to your new oasis in the city! Centrally located in the very heart of Austin. Please call to schedule a viewing. 2 Bedroom 2 Bath, 986 SqFt. Available now, a unique two bedroom luxury apartment home on the most happening of streets of Austin. Just a stones throw away from, Zilker Park and Barton Springs.This loft style apartment home comes with deep mahogany finishes to the cabinets and sparkling marble counter tops in the kitchen. This retreat is designed for the sophisticated individual who enjoys the finer things in life. If you're going to do it right, this is the place for you! One month free on 12 month lease, equals effective rent of $1640 per month. Please call to schedule a viewing. 1 bedroom 1 bath 650 SqFt.